North Platte graduate Emilee Buckler was hired by the district to be a preschool paraprofessional during last month’s board meeting. A North Platte graduate has been hired as a preschool paraprofessional for the district. Emilee Buckler was hired during the closed session portion of the board of education meeting on Wednesday, Jan. 16 to work with at the preschool aged-children in Camden Point. She started her job on Jan. 22. At that building she is one of two paraprofessional assisting Anna Payne for the building that works with students between the age of 3 years old and pre-kindergarten. During her first week on the job ­— albeit shorted due to weather issues — she worked with more than a dozen students. The 2012 North Platte graduate recently graduated from Central Methodist University in Fayette, earning a degree in elementary education this past December. She is now certified to teach grades first through sixth grade. 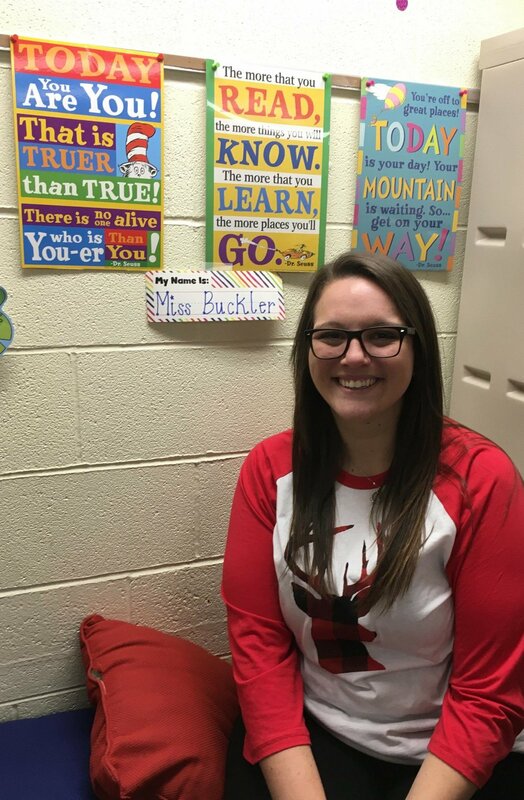 Buckler, who played basketball at Central Methodist before surgeries ended her career, did her student teaching at East Buchanan this past fall. The Camden Point resident had planned to be a substitute teacher this semester while applying for teaching jobs. She heard about the job opening at North Platte and decided to apply. “It worked out well,” Buckler said of recently graduating and finding a job at her alma mater. This isn’t her first time working for North Platte. After initially graduating in 2016 with a degree in educational studies, she worked as a para in elementary school, but decided to go back to CMU to get her teaching degree. Buckler now helps coach a fifth-grade basketball team with her high school coach. This past summer she also coached a high school team with players from Mid-Buchanan, East Buchanan and North Platte. When not coaching basketball, she also spends time with her animals — a dog, cat and a rabbit. During the same board January meeting, superintendent Matt Karl got a two-year extension to his contract through the 2020-2021 year. Enrollment numbers were discussed and the school district numbers are almost identical to last year. This year’s count was 606. Projections for the 2019-2020 school year is close to the same at 603, with the two largest classes being 9th graders (55) and 4th graders (57). Next spring’s senior class projects to have 37 graduates. The final payment to Universal Construction was completed and came in $71,000 below the maximum number. The lower-than-expected cost allowed the district to complete other projects like the HVAC unit replacement at the high school. Completed the purchase and installation of a new sound system, lighting, rigging and individual microphones for the junior high school. The cost was split between the district, the music boosters and the Platte County Outreach Grant Program. Olivia Rogers won the Geography Bee and Jenna Cassity was the runner-up at North Platte Junior High. Reece Hinton was third chair all-state with the euphonium at the state meet in December. Approved a contract with Mosiac for athletic training for $5,500 for all home football and basketball contests and approved a contract with Walsworth for the high school yearbook for $6,294. In the December meeting, a contract was approved with UCP for children who are eligible for early childhood special education. The classroom is supervised by Anna Payne and has 16 students. UCP will provide progress notes to the district as outlined in each student’s individualized education plan. Services include occupational, physical and speech/language therapy.